For some reason, your beard just isn’t working. You can’t put your finger on it, but, when you see other beards you get jealous. Why doesn’t my beard look soft, full and healthy, you ask? Because it isn’t. Your beard doesn’t look as good as it should because it is wiry and scraggly. And ladies don’t like a prickly beard. Not to mention it is also curly and all over the place. Now that you have identified that you have a rough beard and instead want a nice smooth one, how do you soften and straighten beard? Follow this guide on how to soften and straighten beard and keep it that way. 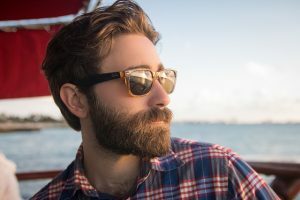 We have all the information you need on the best beard softening and straightening products and how to make a routine to keep your beard soft. Whether you are trying to grow a yeard, or are just trying to keep your beard soft so it doesn’t bother your partner, you need to get with a program. Why Is My Beard Rough? As your beard is exposed to the elements the ends of the hairs get frayed. From the cold, from your water, the sun etc. All these things damage your hair in general, but since your beard is naturally wiry, it makes it even worse when the ends get split. Once your beard has split ends, there is just no way to properly groom it. It won’t smooth out, you will have trouble getting to style and it will always look frizzy no matter how often you comb or brush it. Your beard hair is very porous since the texture is rough. That makes it very easy to dry out. As your beard loses its moisture, it becomes even more rough in texture and harder to get the beard hair to lie down. This is inevitably how you end up with split ends like I just wrote about. When your beard is dehydrated, it will never look good. It will look dull and thin. When you want a soft beard with a healthy sheen, it needs to stay hydrated. If you live in a dry area like in the Southwest US, then this is a problem common amongst the bearded men there. Your beard needs its own natural oils to keep itself hydrated, healthy and strong. If you shampoo too often, then you strip away these natural oils. How often you should shampoo a beard depends on how oily your skin is and how thick your beard is. Generally, I recommend shampooing once to twice a week at a maximum to soften and straighten beard. Don’t be tempted to not shampoo altogether for fear of drying out your beard. Your skin needs to be washed for your beard to grow healthy and happy. So shampooing is not just for your beard hair. And definitely don’t use the same shampoo you use on your head. 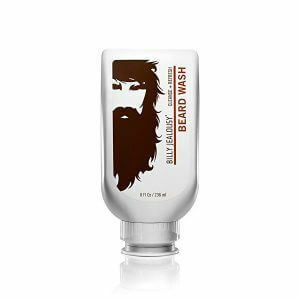 You need a beard shampoo that is formulated specifically for the type of hair on your face as it is much different than the hair on your head. And similarly, your face is not the same as the skin on your scalp. If you never comb or brush your beard, you never trim it or condition it, or you never use any beard softening products like a beard oil or balm, then you’re gonna have a bad time. You need to keep up on your beard care routine if you want to soften and straighten beard. If you don’t then your beard texture is doomed to be wiry, scratchy and hard to tame. If you don’t already have a beard grooming plan of action then check out our article on how to groom a beard. If you are only just starting a grooming routine after never having done it, then I recommend some patience. Your beard that has been neglected is going to be a hard case. Seeing the results of grooming will not happen right away and will not be dramatic. You will need more time for your beard to show signs of health than if you just had a small lapse in grooming. Don’t give up and think it’s a waste of time if you aren’t seeing immediate results. Your beard is what you eat. Put some good stuff in your body and your soft beard will thank you for it. To see the best results, you need to treat your beard from the inside as well as from the surface. Take a holistic approach and go nuclear on it. Don’t leave anything up to chance by having a plan that includes nourishing your hair from all sides. If you eat a lot of junk food or just are a meat and potatoes guy, then you owe it to your beard and your body to diversify your diet. What should you eat to have a healthy beard? Eat lots of oily fish like salmon or sardines, flax seed, walnuts or any other foods high in this fatty acid. There are some studies that show that Omega 3 fatty acid can help your hair grow faster and thicker. If your only concern is to soften the beard then take note that it also keeps the skin hydrated and regulates sebum production. This translates to a healthy beard that has a healthy glow to it. This mineral will help repair skin and hair. By repairing the hair’s cells it will smooth out the cuticle. This will allow your beard to grow out straighter when the new growth phase begins. Eat food like oysters, spinach and pumpkin seeds to load up on zinc for your beard. These vitamins aid in good sebum production which will keep your beard hydrated and healthy looking. Get your daily dose of broccoli, peanut butter and fruit to get that sebum flowing. If you are shampooing your beard, then this will help make sure that you aren’t leaving your beard dry afterwards. Keeping the sebum flowing will get that natural oil back onto your beard where it can do its thing. Let’s start at the beginning and go over some basic beard grooming tips to soften and straighten beard. As I already mentioned, you don’t want to over shampoo your beard as that will actually make the texture even rougher and more wiry. It does need to be clean, however. Once or twice a week give it a nice clean and then follow up with a beard oil or conditioner. Make sure you wash it thoroughly and get right down to the skin. Your skin underneath the beard also needs to be clean and hydrated to result in a softer beard. Don’t use the same shampoo you would on your head as your beard hair is different. The best beard shampoo I can recommend is Billy Jealousy Beard Wash. It has all the essentials that your beard needs to get clean and stay healthy and hydrated. Billy Jealousy is one of my favorite beard brands out there. They have the shave and beard market understood and listen to what their customers need and want. They use mostly natural ingredients when they can, also. You can use a conditioner for softer facial hair after shampooing your beard or even on days when you don’t. If you feel like your beard is particularly rough and scratchy, then go ahead and use it everyday. What is the difference between beard balm and beard conditioner? They both kind of do the same thing, which is keep your beard hydrated and soft, but they act differently. A beard conditioner is just like what you would use on your head hair. It gets the hair soft, but you wouldn’t use it to style your hair. A beard balm is almost like using a styling product on your beard that also has some conditioning properties. Sort of like a grooming cream that you would use on your head hair. It will keep your beard in place. 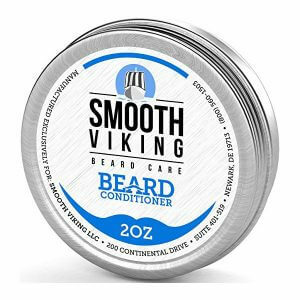 For a straight up conditioner, I like the Smooth Viking Beard Conditioner. This works great no matter what length your beard is. It contains argan oil, so not only will your beard be softer after using it, but it will also be stronger. Whatever brand you end up using, make sure it contains argan oil. It is simply one of the best things you can put on your skin or hair. You should definitely be using at least one or the other to soften and straighten beard and keep it from getting out of control. Beard oils are great on beards that are short to medium in length. The oils will, at the very minimum, hydrate your beard and keep it soft to the touch. In my opinion a good beard oil is best used to prevent a beard from getting unruly and gives you a silky beard and prevents itchiness. If your beard is already too rough for you to handle, then I think you need a beard balm. Beard balms generally last longer than beard oils and have other ingredients that help condition your beard and soften an already wiry beard. With either beard oil or beard balm I recommend ones that use either jojoba oil or argan oil as the main ingredient. Whichever one you use, if your beard is a tough case or your skin underneath needs extra nourishment, then you should use these beard softening products everyday to soften and straighten beard, get it back on track and leave it soft and silky. One of the reasons your beard feels rough is that you probably have a lot of flyaway hairs. Since your beard grows in a lot of different directions, it pays to groom with a good quality beard brush or comb. Keeping your beard growing in the same direction will prevent split ends from happening and your beard will stay softer as a result. This is the best way to soften and straighten beard. In addition to preventing split ends, your natural oils will be distributed all over your beard when keeping it groomed, especially if you use a beard brush. No matter what, you should be doing this everyday since it will also help the products that you have been using to do their thing. If you don’t use a brush or comb then you won’t get the full benefit from using the best beard grooming products for a softer beard. After using all the grooming products to soften and hydrate your whiskers, then using a brush will also help your mustache hair to lie down, as well. Once you have gotten your beard care routine sorted, you should do your best to prevent the beard from getting rough again. In this section, we’ll cover what not to do when it comes to keeping a beard soft and smooth. Alcohol in your grooming products is the best way to dry out your beard hair and leave it brittle. This will increase the chances of split ends and your beard will be rough and wiry. If you use a plastic comb or brush with plastic bristles, you will end up tearing the follicles of your beard. Stick with either a resin, wooden or bone comb to avoid static electricity and be gentle on your beard. For a beard brush, use natural boars hair bristles as it is very gentle on the beard. If you are vegan, there are boar friendly brushes out there, but try to avoid ones that use a hard plastic bristle. Choose ones from reputable beard grooming brands if they have a vegan or Halal beard brush. You can definitely use a hair dryer on your beard, especially if you want to straighten a curly beard as we will go into further down the article. Just don’t use the high heat setting. If it has a warm setting then try that, but if it is only hot or cold, definitely go cold. No matter how well you take care of your beard, you will undo all the hard work by using too high heat with a hair dryer on your beard. 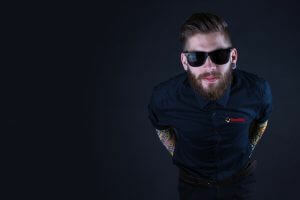 Now that you have your beard soft and manageable, you may want to straighten it to have it look uniform and smooth. If you have a very curly beard, then it doesn’t matter how soft you’ve managed to get it, it may still look unruly. Time to bring out the big guns and straighten the beard with some products. If you have been wanting to style your beard but can’t seem to straighten the curls enough to get the beard to cooperate, then you should use a hair relaxer. Using a hair relaxer is a great way to get rid of the curls in your beard, especially for African American beards, and make it more manageable to style. You won’t have perfectly straight beard hair after using a relaxer, but you will see a marked difference. How to use a hair relaxer for your beard. You’ll need three things to get started with straightening your beard. Obviously, the chemical beard straightener is the most important thing, but you also need a neutralizing shampoo from Amazon.com to wash the beard right after you use the straightener, and some protective gloves. 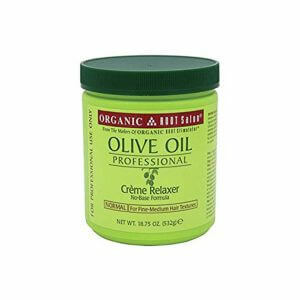 The men’s hair relaxer cream for beard that I recommend is Organic Root Stimulator Olive Oil Professional Creme Relaxer also on Amazon.com. The first step is to make sure your beard is clean. Next, carefully apply the cream in section of the beard. Start in one spot that is about two inches wide and rub the cream into the hair. Careful to not get the cream on your skin, either under the beard or on the sides of your cheeks and neck. Do this until you have the entire beard covered in cream. Set a timer according to the instructions and when it dings, then start removing the cream. Start by just rinsing it out with water, and then lather up the beard with the neutralizing shampoo. Lather it up well and rinse. You will definitely need to repeat the shampoo at least once. If the lather continues to look pink, then it means there is still some relaxer in your beard so keep shampooing and rinsing until it is no longer pink. At this point, dry your beard and apply some conditioner. The beard should be pretty moisturized due to the olive oil in the relaxer, assuming you used the brand I recommended. But, you are hedging your bets just in case by using a beard conditioner. Keep in mind that if your beard i scurly, then when it grows, the new growth will also be curly. You will likely need to do this every few months to keep it straight. What you will need is a good mini or travel straightening iron. Don’t do this often as the heat from the iron in direct contact with your beard will cause it to dry out, and will make it brittle. Using your beard comb, lift a section of beard and clamp the iron on. Slowly pull the iron down to the end of the hairs and repeat. It’s best to work methodically here and do it one section at a time. Also, your beard should be on the longer side for this to be effective. I would say no less than three inches. A good flat iron that is gentle on the beard is this travel one. 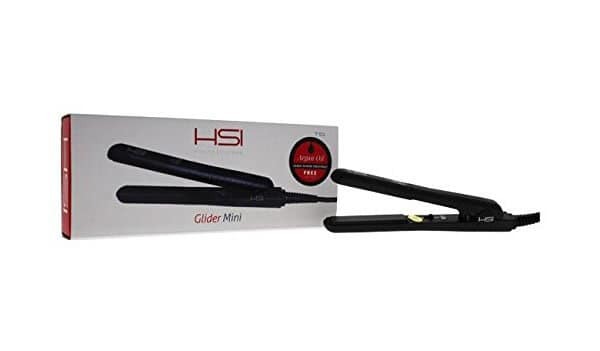 HSI PROFESSIONAL Glider MINI. It is small enough to make it easy to use even for a guy. After you use the beard straightener, make sure you put in some beard oil or balm to get the moisture back where it belongs in the follicles. This will only last for a day or two before your hair goes back to being it’s wild self again. Is it Worth it to Straighten or Soften Your Beard? To the question about softening your beard, yes, absolutely. Doing that routine will leave you with a beard that is a pleasure to touch and to look at in addition to being much healthier. If you’re going to grow a beard it goes without saying that you need to take good care of it and learn how to soften and straighten beard. As far as straightening your beard. This all depends on how important it is to you to straighten a curly beard. It isn’t important and doesn’t leave your beard healthier for having done it. In fact, it might even slightly damage your beard. Only straighten it if you are also willing to do the proper grooming to repair it after. Have you ever straightened your beard? Tell us about what happened by leaving a comment below. If you have any other questions, or feel I missed something here, then reach out and I will answer any question you have on how to soften and straighten beard! Are These the 5 Best Mustache and Goatee Style for Your Face Shape?